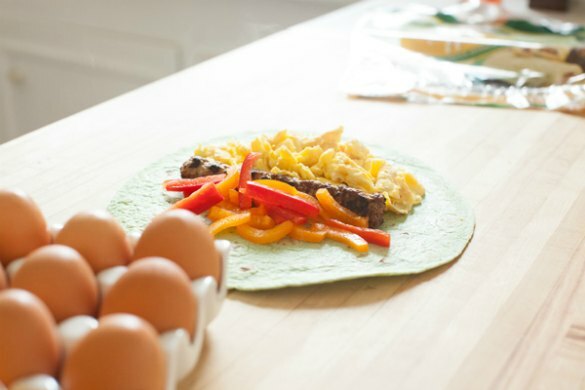 Today’s better-for-ya breakfast burrito recipe and post is from Brandi Koskie at DietsInReview.com with photos by Kacy Meinecke. Each month DietsinReview.com shares an amazing recipe with us. See some of their other yummy recipes here. Breakfast is crucial, kids. This isn’t a joke or health industry puffery. Breakfast is super legit. You can’t skip it. You can skip to the lou, you can play with an actual Skip-It, but you cannot forgo breakfast. That goes for you, and it really goes for your kids who are headed back to school soon. I’m a working mom, too. I get it. That clock ticks faster in the hour before you have to be somewhere in the morning than it does the rest of the day. Regardless, I make breakfast every day. It’s not anything June Cleaver would be too excited about it, but it’s healthful, it’s nutrition-packed, and it gives me and my family exactly what we need to wake up our metabolisms and fuel our mornings. Smoothies are the easiest, they take less than five minutes and feed all three of us. I like to make my own waffles and freeze them for those really time-crunched mornings. But when we need something that will really stick to our bones, something hearty when only a comfort food breakfast will do, I make breakfast burritos. Again, they take only a few minutes and are totally portable. I like portable, healthy breakfasts — smoothies, waffles, heck, we’ve even done a banana and a cheese stick! My Better Breakfast Burrito is just that — better than any white-flour, grease-bomb burrito you may be accustomed to. 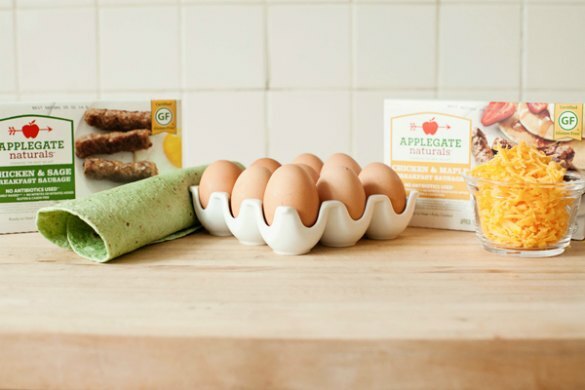 While you can use any leaner, cleaner breakfast meat you like, I roll with Applegate Farms. My daughter loves the chicken and apple sausages, I like the more savory chicken and sage. Over regular pork sausage links, you cut the calories and fat in HALF! Not to mention, the meat is humanely raised, nitrate- and nitrite-free, and gluten-free, with many of their products being organic, too. 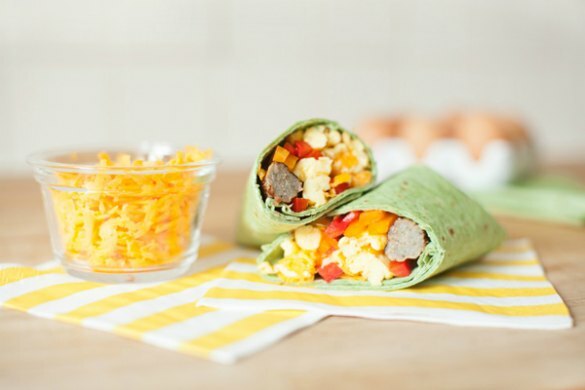 In the amount of time it takes to scramble a couple of eggs, you can warm the sausage in the microwave, and fill the better-for-you spinach tortilla with the shredded cheese and chopped peppers. Easy peasy, lemon squeezy. Breakfast quick and easy! 1. While the tortilla is warming in a hot skillet, scramble the eggs on the stovetop and warm the sausage in the microwave. 2. Inside the warm tortilla, place the eggs, sausage, cheese and chopped peppers. 3. Fold the ends inside, then roll over until the tortilla is completely closed. What an inspiring recipe for a busy morning! My toddler will definitely love this too! This burrito is absolutely brilliant and delicious! And I just doll it up with some chili sauce to give it an added spice.. I love the colors from this Burrito. It sure beats cramming around the kitchen in preparing breakfast every morning. It’s not only time efficient but healthy for the whole family as well. It’s also very eye-pleasing with it’s different colors. Kid will definitely love it. Yum! Breakfast burrito are a godsend! Now, with this recipe, I can make one myself. Thanks! I love burrito and will surely love this one! Thanks for sharing this wonderful burrito recipe! My family will surely love this breakfast burrito! Thanks for sharing! My husband will surely love this breakfast burrito! Thanks for sharing this recipe! My mouth waters at the site of a burrito! I will definitely make this for breakfast. Thanks for sharing! If this is what’s served for breakfast, then I would really look forward to waking up! Thanks for this great article! I love burritos. It’s great for breakfast. Great read! I really love this Burrito, it’s healthy and nutritious!